Now that the warm weather has come, thoughts about enjoyable family times out on the water come to the forefront of many people’s minds. Times spent with family boating can create memories that will last a lifetime. People looking to purchase a new boat with the whole family’s interests in mind should consider the type of boat that would be most suitable for the family’s enjoyment. Does the family simply enjoy getting out and slowly cruising around? Do they enjoy a quicker pace, and perhaps get into water sports? Is it a fishing family? These may be some questions to address when looking for a boat that is suitable for their needs. Once big flat platforms with a slow, noisy motor on the back to push the vessel around at little more than walking speed, they’ve come a long, long way since then. Some pontoons now can accommodate a couple dozen passengers. 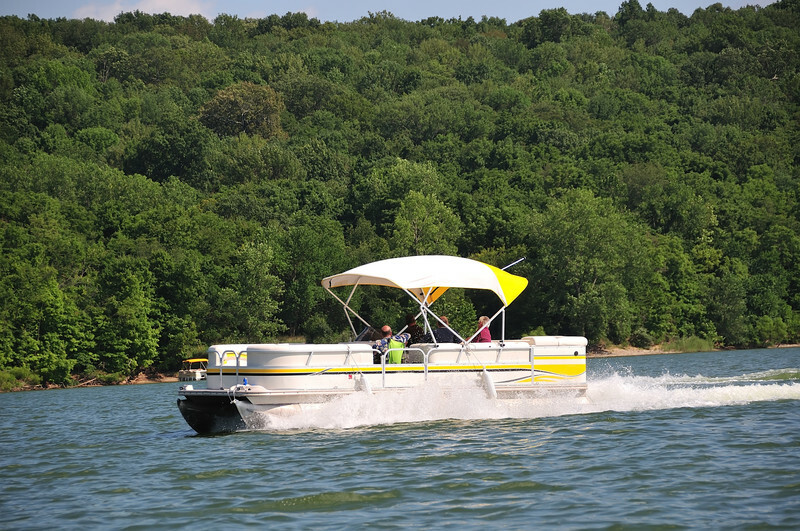 Pontoon boats today, which can exceed 50 MPH in speed, can pull tubers, wakeboarders, and skiers. Many options are now available on these boats, which include multiple outboard engines, with amenities on board that can include moveable tables, posh seating, dynamic stereo systems, wet bars, and even mood and underwater lighting. You can enjoy everything from a leisurely cruise to a raucous party onboard anytime! Perhaps the most comfortable boat on the market today, families love them for their many amenities. Comforts include a head (restroom), galley (kitchen), and one or more berths (sleeping areas). Many feature heating, hot water, air conditioning, generator-produced power, and when on shore, a hookup for quick access to shore power. They are ideal for day cruises and especially fun on overnight trips. It’s an enjoyable experience for every member of the family. These are the most popular sports boats and runabouts and are very popular with families that enjoy a lot of activity out on the water. The open bow up front provides plenty of seating, with beautiful, unencumbered views of the waterways around and ahead of the passengers. Most bowriders have a tow eye at the stern, ready to tow a tuber, wakeboarder, or skier. Most likely, the bowrider will have a swim platform with a ladder for entering and exiting the water. Water sports are the fundamental reason many people are interested in bowriders, and the swim platform and ladder are big draws that make this boat attractive. These boats are seemingly a marriage of the bowrider and pontoon boat. They resemble the bowrider in appearance, but their bows are more rounded, which creates more seating capacity and a very stable platform up front. Similarities with the pontoon boats are that deck boats have become bigger and broader, while the pontoon boats have become more performance-enhanced, posher, and more powerful, bringing these two boat categories closer together. For water sports enthusiasts, this is another great option. Families really couldn’t go wrong with any of these or any other models. The important thing is that they’re all getting out there together on the water. The fun and great memories will soon follow. We are here to help with everything from getting a boat warranty to financing your new toy. Contact Southeast Financial to talk one of our agents today to get the help you need!